It's here. I'm officially another year older. Reflecting on the past year I have so much for which to be grateful - the birth of my second son and my first nephew, an amazing and steady family that only continues to grow, a network of friends and neighbors that have been unwavering in their love and support, the opportunity to step away from work to spend more time with my boys and finding a church that will help foster a love of Jesus in the hearts of my entire family. 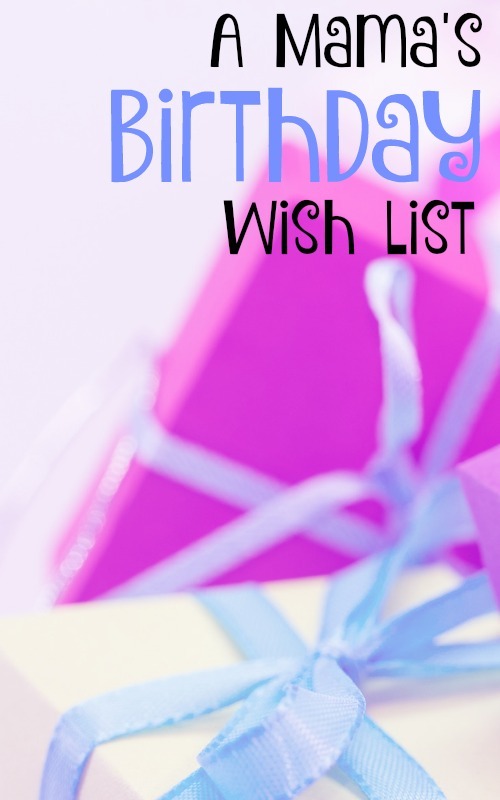 So if you're wondering what a very blessed Mama has on her birthday wish list, wonder no more. Lucky for you I've put together a list of all my birthday wishes. I should warn you this may not be the list you're expecting. Yep, I would like to pee with the door shut and without a youngster narrating what's happening. When I do have a chance to paint my nails I normally only get 3-4 painted before my fingers need to be moving and not idly drying. If I just happen to paint more than four at a time there's no doubt that at least half of them will be ruined before the polish has a chance to completely set. I just got dinner on the table. Sometimes, it actually even smells quite delicious and like clockwork the baby is crying and needs a diaper change and bottle. My the time I'm finished settling the baby, dinner is over and it's time to start bath time with my oldest. I would like to take a nap, sleep in past 8 a.m. or go to sleep before 11 p.m. I don't want to be greedy so I'd take one of any of those three options. Sleep is at the top of my wish list this year. Normally my idea of a bubble bath is being splashed by a little one after he pees in the water. I would like a half hour, scorching hot water, some adult bubble bath and maybe a good book - okay even a magazine would do. Like a moth to a flame a two-year-old is drawn to anything that produces fire or anything dangerous for that matter. I want to light a candle, maybe two, without fear that my house will burn down or that one of my little ones will torch themselves. Okay, maybe not so much, but I'd like the option to shave my legs. Truth be told even if I could do this I'd still likely decide to negate it altogether. Minty fresh breath. No grimy teeth. One can only wish. I don't have the time to style my hair, sometimes I don't have the time to comb it. But occasionally I'd like to wear it down and feel like I'm not confided to one style that keeps it all out of my eyes and out of the open grasp of an infant. I would like to hear my two-year-old sing, "Happy Birthday"
My big boy has been practicing singing, "Happy Birthday" not necessarily for me but just in general. He loves a good birthday party. I don't think there could be any sweeter sound then him singing to me, a rarity since he seems to get shy when asked to perform. This year my real wish is simple, I would like nothing more than to hold all my boys and thank God that he has blessed me with the knowledge that "things" no longer make my soul happy - I'm happiest spending time with the people I love. Wrapped in the warm embrace and knowledge that I have an amazing family both near and afar. People that love me and whom I love. Happy birthday to me. Becoming another year older isn't so terrible. These are beautiful wishes for a new year! Simple but meaningful. I hope they all come true! This is the perfect list, especially the nap and using the restroom, alone. What a dream it would be for every item on this list to come true! Hopefully that happens for you mommy!